Paulo Boute is one of the pioneering birders and ornithologists in Brazil. Paulo has over 35 years of experience guiding birders and photographers throughout Brazil and abroad, but his first love is the wildlife-rich Pantanal—an area he knows intimately. 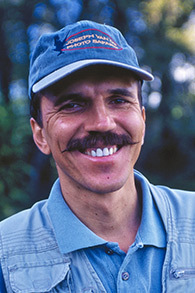 Paulo has led private wildlife expeditions for such legendary birders as Roger Tory Peterson and Robert Ridgely. He also shares his knowledge and wry sense of humor with Brazilians on his weekly radio program concerning birdwatching and environmental education. Paulo lives in Cuiabá, Brazil—gateway to the Pantanal.